Since October I am working on my masterthesis about Human Plant Interfaces. I chose this topic because plants are not well researched in an interface design context. Plants are vital for our life but they are very rare in urban environments. 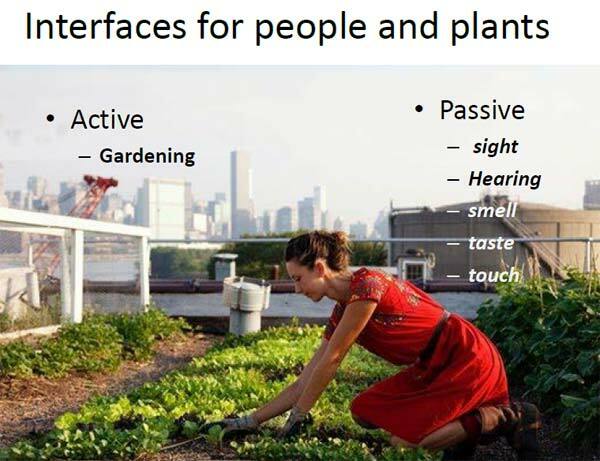 In the context of my thesis I will research plants under the point of view of an interface designer. My objective is to find ways for integrating plants more in our daily life. The results of the research will be shared on my blog. I am happy about every feedback and open minded for discussions. At the university I showed a small presentation of my topic, it will give you an idea what I am planning to do.